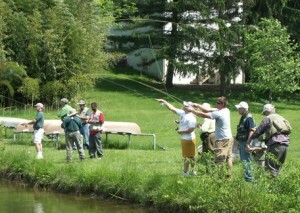 The 2019 Fly Fishing School is full. No more registrations can be accepted this year. This is an all day immersion into fly fishing. The day begins with sign-in and a continental breakfast. After some announcements and a brief welcome it is time to learn about bugs and knots and where fish hang out. Then it is lunch time which is followed by a tour of West Chester Fish Game & Wildlife Association’s cooperative trout nursery. After the tour it is on to the pond to learn to cast or to the stream to watch a demonstration of actual fishing techniques and a discussion of stream etiquette with questions and answers encouraged. 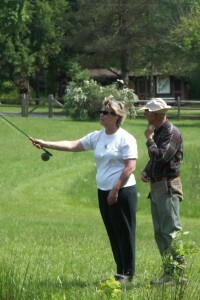 When all of this winds up we send you out with an experienced fly fisher to see if you can apply what you learned and actually catch a trout on West Valley Creek or another nearby stream. Dinner follows the fishing and concludes a very full day. 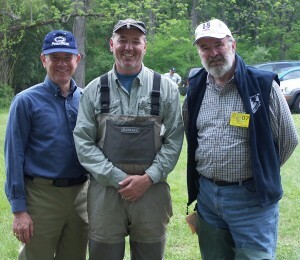 I want to thank you and the entire VF Chapter for an amazing day last Sunday at the Fly Fishing School. It was an experience worth many times the price we paid. Everyone was knowledgeable, patient, and generous; it was a day that we will remember forever. I appreciate all of the time that you spent working with Jack on his casting. Additionally Joe Armstrong absolutely made the day as Jack caught no less than 30 fish in his pond at the end of the day, he made me a hero; he is a great guy. I look forward to seeing you and the other members soon.